If you like to ride bicycles and eat food, then this week's featured art is perfect for you. 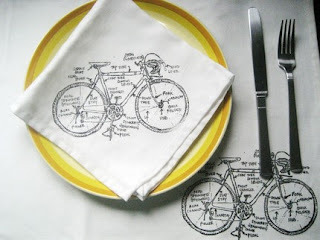 These placemats and cloth napkins designed by GirlsCanTell feature a handprinted diagram of a bike. Dinner guests who don't know the difference between the top tube and down tube can get a quick lesson on the anatomy of this fine form of transport. The napkins and placemats are washable and printed in black on white cotton for a classy look. Bon appetit!